Download the latest issue of The Consultancy, Accessa’s quarterly magazine for customers, business leaders who rely on coatings and chemicals, and industry leaders. Hold on Tight: Accessa President/Principal Joe Todd shares highlights from an exciting year at Accessa Coatings Solutions and Accessa Chemical Solutions. 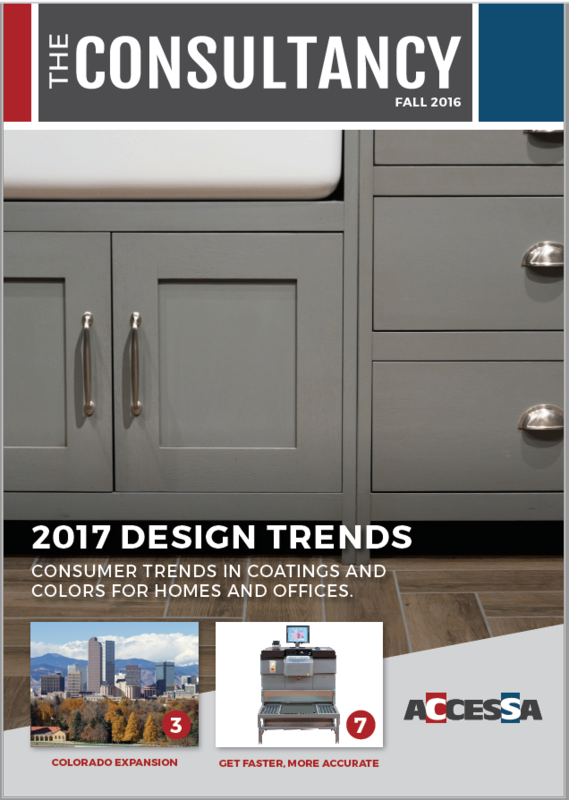 2017 Design Trends: Our preview of the complete annual report of home and office trends in coatings, colors and more. Product Watch: Check out a buzz-worthy millwork primer, self-sealable topcoats, a coatings remover and more. You might discover a new favorite product to improve your process. Accessa Expands West to Denver Area: The Paint and Lacquer Co. team, which has been serving the Denver, Fort Collins and Colorado Springs, Colo., markets since 1937, is now part of Accessa. Improving Service & Color Matches: Continuously improving operations at Accessa helps our team and customers stay ahead. Read about Investments in equipment and new hires. And more information worth reading.